It’s been a little while, but you know it was worth the wait. Antidote is back with an absolute mouth-waterer for all fans of acid, groovy & hard tribal techno, . 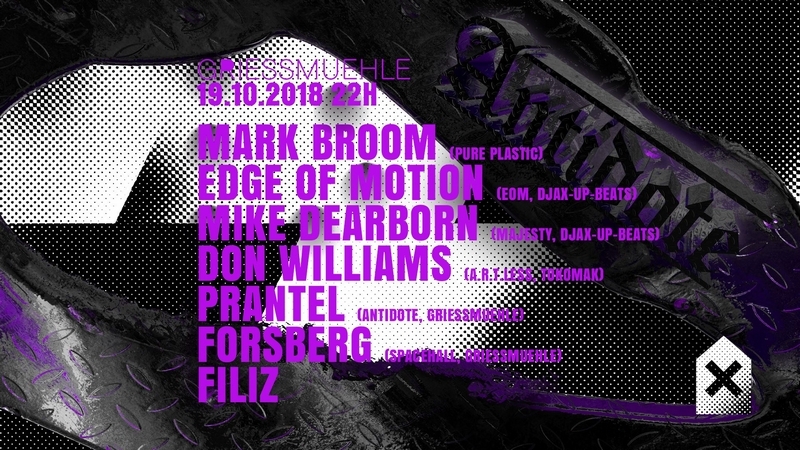 Representing the early 90s are NL’s Edge of Motion & Chicago’s Mike Dearborn, while Berlin Mixmaster Don WiIliams (Griessmuehle Debut) has brought his protegé Forsberg & former labelhead Mark B(ig)room, representing Pure Plastic & the UK. Upcoming talent Filiz is giving her antidote debut as well, so get down’n’dirty, because tonight we’ll celebrate techno in it’s purest & most funky form.